recorded as Laura Freeman, 18, born in Tennessee, both parents born in Tennessee, boarder in home of Lucinda Law, 55; with Wiley Freeman, 24, born in Tennessee, both parents born in Tennessee, physician. Laura married Wiley Howell Freeman probably in Macon County, Tennessee. first known child born: Irving Seagraves Freeman probably in Cooke County, Texas. 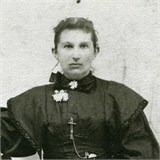 second known child born: Kate Freeman probably in Cooke County, Texas. third known child born: Eunice Freeman probably in Cooke County, Texas. recorded as Laura S. Freeman, 38, born in March 1862 in Tennessee, father born in North Carolina, mother born in Tennessee, married 20 years, mother of 5 children with 3 still living, wife of Wilard Freeman, 44, born in September 1855 in Tennessee, father born in Virginia, mother born in Tennessee, merchant in general store; Irving, son, 15, born in February 1885 in Texas, both parents born in Tennessee, at school; Kate, daughter, 4, born in October 1895 in Texas, both parents born in Tennessee; Eunice, daughter, born in September 1898 in Texas, both parents born in Tennessee. Laura and family moved to Floyd County, Texas. recorded as Laura S. Freeman, 48, born in Tennessee, father born in North Carolina, mother born in Tennessee, married once, mother of 5 children with 3 still living, wife of Wiley H. Freeman, 54, born in Tennessee, father born in Virginia, mother born in Tennessee, doctor in own practice; Katie, daughter, 14, born in Texas, both parents born in Tennessee; Eunice, daughter, 11, Texas, both parents born in Tennessee. Laura and family moved to Washita County, Oklahoma. recorded as Laura Freeman, 54, born in Tennessee, married, born in Tennessee, both parents born in Tennessee, wife of Wiley H. Freeman, 64, born in Tennessee, both parents born in Tennessee, physician in own practice; Katie, daughter, 24, born in Texas, both parents born in Tennessee, teacher in literary school. recorded as Lana S. Freeman, 68, born in Tennessee, father born in North Carolina, mother born in Tennessee, wife of Dr. Wiley Howell Freeman, 74, born in Tennessee, father born in Virginia, mother born in Tennessee, medical doctor. Laura died at age 87 in Sentinel, Oklahoma. [S334] Quoted from a letter dated 8 April 1950 by William Webb Freeman published in the: Macon County Times 27 April 1950. [S335] 1900 census for Cooke County, Texas . [S333] Armour Family Tree , (Ancestry.com).